Last Saturday was the Worldwide Day of Occupation, when protests of all sizes occurred in 1500 cities and 82 countries across the globe. Ten thousand people marched in the streets of Madrid. It’s estimated that 20,000 showed up to flood Times Square. And at the height of the protest here in Phoenix, between 1-2 thousand of us came to show our support at Cesar Chavez Plaza downtown. Since the protests began on Wall Street one month ago, there has been a certain amount of criticism aimed at the people involved. One common charge is that the protestors are just bored college kids who protest for the sake of protesting. 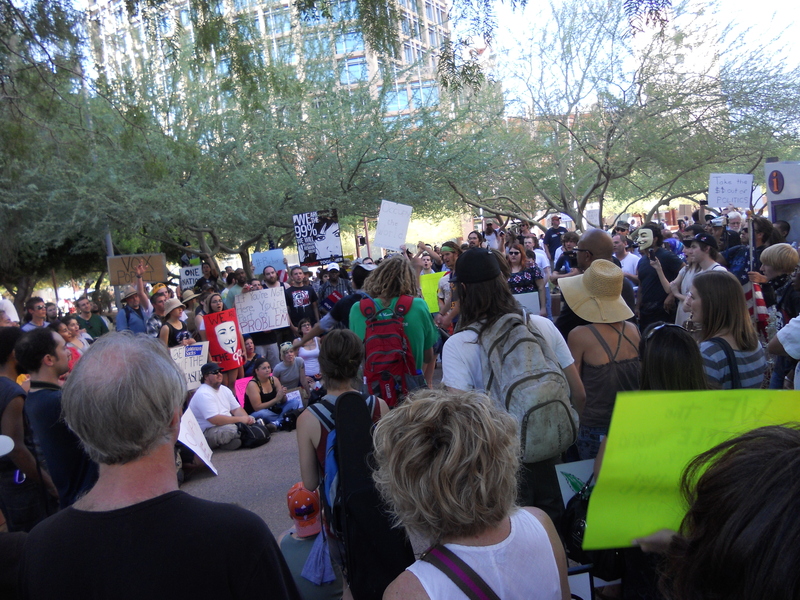 What I saw at Occupy Phoenix couldn’t have been further from that accusation. There were plenty of young people airing their frustrations over the lack of opportunity many of us will face once we graduate college. But there were also entire families whose small children proudly waved American flags as we marched as a group towards Martha T. Hance Park. There were a surprising number of older Americans airing the same grievances as the youth, including a stooped elderly couple that made sure to be in the front row of one of the impromptu assemblies at Cesar Chavez Plaza. The husband wore a hearing aide, so the wife made sure to wave his hand in support for him whenever a speaker expressed frustration that our system has failed us, the 99%. Another criticism has been that the message is too muddled to make a difference. But I disagree. One message was loud and clear: we need peaceful action to show the world we’re listening, that the power must remain in the hands of the people. The myriad of problems the world faces is too large and diverse to fit on a protest sign. But the message that the interests of the many must take precedence over the interests of the few is one that unites the world, from Hong Kong to London to New York to Phoenix. This weekend made me think about why art of all kinds is so crucial to civilization. Writers and artists are responsible for interpreting our surroundings, encapsulating the world in which we exist in a poem, or a story, or a painting. We make art to communicate and share ideas with the people of today, and to make our voices heard to the people of tomorrow. We are living in turbulent, fascinating times. I can hardly wait to see what art arises out of our struggles.